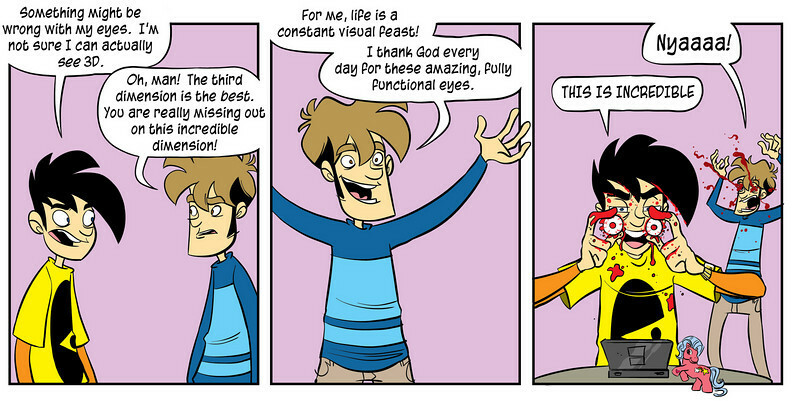 This year was my first time attending Penny Arcade Expo (PAX) and boy howdy was it fun. Oh sure I have been to conventions before but PAX is different and, now, I am different after having been. No the skies did not open and no unicorns reared in a triumphant gesture of evolutionary change but the change in me was more subtle (but more on that later). In case you aren’t aware, Penny Arcade Expo is a weekend-long celebration of gamer culture. This is key: A CELEBRATION of gamer culture. Now for me The idea of game culture is a relativly new one. Having spent a large portion of my life, especially my awkward youth, doing any and everything possible to not be labeled a ‘geek’ , games where just something I did, not something i celebrated. Often I just played them at home, with my younger brother, or my young parents in between playing outside and bringing to life my imagination by way of drawing and writing. As a result the slow increase of ‘geek’ solidarity and celebration has always made me somewhat uneasy, a topic I will discuss further in future post “I am NOT a nerd”. Digressions aside after having spent 3 full days at PAX, a con like none other I’ve been to, I now look forward to future exchanges with folks who share these interests. The question I would be asking of myself if I were reading this would be “What makes PAX different”. The answer to said question is a little tricky for me to explain but I am going to try anyway. This point is a valid one and as such should be noted but is not one that would apply to everyone. 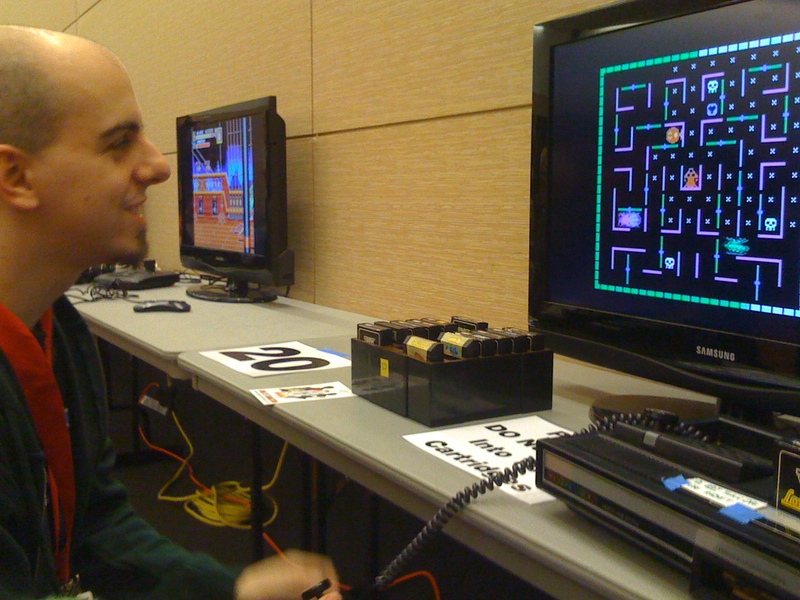 My introduction to PAX was made possible by the fella I date. Someone whom I love and admire and who encourages me to embrace the things that interest me no matter what anyone else might think. Should I suddenly have a great love for collecting stamps or war memorabilia, he would probably be just as accepting. Should my interests have me suddenly stealthily sneaking through the night stealing the souls of the dammed, well, we might just find a line there. Maybe. Familiar with the comic stylings of Penny Arcade Expo’s creators, Jerry Holkins, Mike Krahulik, and their webcomic Penny Arcade, I ensured that I would be up to date on what was happening with this convention and what I might expect. The idea that there might be tens of thousands of people in one place at one time who could easily point out my knowledge failings when it came to specific aspects of this culture was preparedly intimidating. After all, I am not a geek right? So this mega ultra geek con would surely be yet another way I would be deemed an outsider. My research took me to twitter, to ustream, to various website forums and what I found out was that there are a lot of really interesting and talented people out there who share one or more of my interests. If it wasn’t my interest in over the top theatrical gameplay, or franchises that I have stuck with for nostalgia reasons, then it was a shared love of art crazy stories or the evolution of the internet and technology. People online are generally awesome but how would that translate to real life? I feared. Much like ‘the research’ preparations for this three day event had me communicating with people online. Sharing stories of travel plans, previous experiences, and watching the schedule as it was being updated, became bonding experiences by way of twitter and web forums. After seeing who was presenting a particular panel at PAX I would quickly make myself aware of the presenter(s) as much as I thought was necessary, which only lead me to more information and more interesting people. I stumbled across many websties that have since been added to my bookmarks because, like me, they were making this adventure to Boston to attend the PAX celebration. While at PAX the con was, for all intensive purposes, just like many other conventions but with an obvious difference: subject matter. While extremely specialized this game convention was also very diverse. Catering to tabletop games, console, pc, and handheld games, there really was something for everyone. If you are the type of gamer who likes to play the newest video games on the newest technology there was a ton of stuff for you on the expo floor. Game previews/booths created lines the extended well beyond an hour’s wait time. If you like playing your favorite game against a group of friends (perhaps show off a little) there were tournaments held every day on every major console for many popular games. If you’re a LAN fanatic there were areas for BYOC and some preset stations as well. If retro was your style there was access to old systems, games, and even,one of my favorites, an arcade room with all cases set to free play (the atmosphere was capped off with the dark room and loud music that I remember from the old arcade I used to skip class to hang out in… sorry mom…). The ever popular handheld lounge, complete with giant beanbag chairs, was perfect for snuggling up with a DS or PSP and was also host to tournaments and a great place for some downtime between scheduled events. Swag Hag? 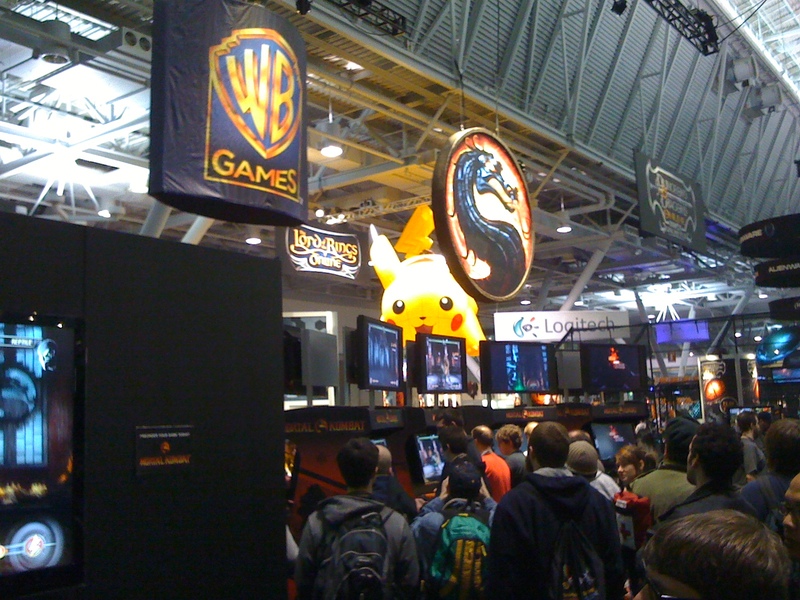 Then you most likely hit up the expo floor right away where booths/companies were sure to reward you for taking the time to explore (and then talk about) their product. The Panels were hopping! Catering to the casual, knowledgeable, and INTENSE game knowledge. Panels were also sure to include information for those with aspirations of making a career in the industry. Cosplayers were in full swing at PAX and some real talent and creativity shone through. Merchandise available at the event was limited but present. And no one needed to go home without a souvenir. Randomness. Ever see a Big Daddy and Little Sister busting a move on the Dance Central Stage? Yeah, that happened. Shot from the expo floor. 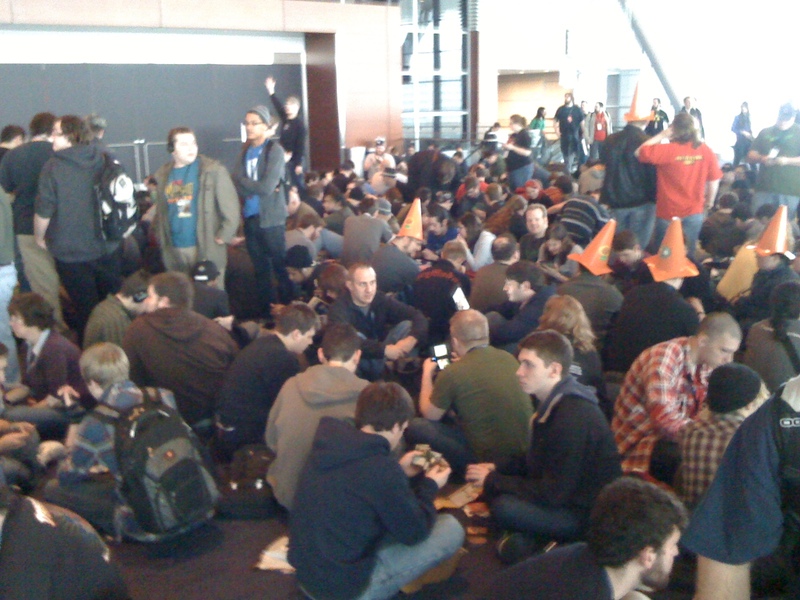 This seems like a silly thing but is most certainly one major part of PAX; waiting in line. While most of my lines were spent waiting for panels I was able to observe a few things. Firstly I observed that there are a lot more people playing Magic the Gathering than I thought. Sitting in line for 55 minutes? What better way to pass the time than to whip out your cards and get friendly with the others in line. ( 😉 ) Another observation of mine was that Pokemon is much bigger with adults than i thought. Having only ever had a brief encounter with Pokemon (in which i was openly mocked) I never pursued it again but after witnessing what was the Pokemon equivalent of a fist bump between two gentlemen waiting in line, my interest was re-piqued. If you were waiting in the line (or in the handheld lounge) and not playing Magic the Gathering, you were playing Pokemon. This lead me to start asking more questions (all of which my sweet fella was more than happy to answer). The only Pokemon question i have left is ‘where do i start?’. During my wait time in line for the Giant Bomb Panel on Friday night I had the opportunity to use a feature of my DS which had been otherwise left useless: Pictochat. While spotty reception made pictochat useless most of the time, during Friday’s line wait i was able to joke and interact with other people waiting in the same line. How fun it was to draw, doodle, and joke with anonymous users who could have been any one of the faceless people in the crowd that surrounded me. One of the waiting lines before the 2-part compression. I’ve said it before but let me reiterate. The people who make up the community that is found at the Penny Arcade Expo are great. Okay I admit it, there are always a few eccentrics in a crowd of that size, but for the most part it was alright. Let me share one small story and hope you get an idea of what I am trying to convey. During the popular ‘make a strip’ panel Q&A’s make the panel interactive and open to the attendees to participate. One at a time people stood up, asked their questions, gave their garb, or expressed their appreciation. One young fella, approximately college age meekly took his place at the mic. He began with an introduction followed by expressing an interest in learning some D&D. I am paraphrasing here but he then said something along the lines of ‘I go to [name] university and I am new but interested in learning how to play [game]. How can i meet like minded people?’. Without hesitation people shot their arms into the air (including the fellow sitting beside me) while Jerry lead him to people in the crowd who were interested in connecting. And just like that, a n00b found a community and potentially new friends. The crowd cheered. That is the moment that really secured, to me, what made this expo so different from the others I’ve been to. Acceptance. Crowd culture. Not only were the people accepting of each other but so seemed the creators. Both Jerry and Mike appeared all over the convention center and every time I spotted them they were engaged with fans. Talking casually, signing autographs, or enjoying the show from the crowd, the two guys responsible for this culture of acceptance were they themselves reachable. Of course Round five was only revealed at the time of the event which made for some really interesting suspense. We went to 4/5 rounds of the Omegathon and I believe it really added to the spectacle that the final round was. Capping off an incredible weekend was the ultimate end to a well fought competition. We had the opportunity to talk with some of the Omeganauts at the start of round 4 and they all seemed to be really enjoying the limelight. Jenga had to have been one of my favorite rounds in an experience I will discuss another time. 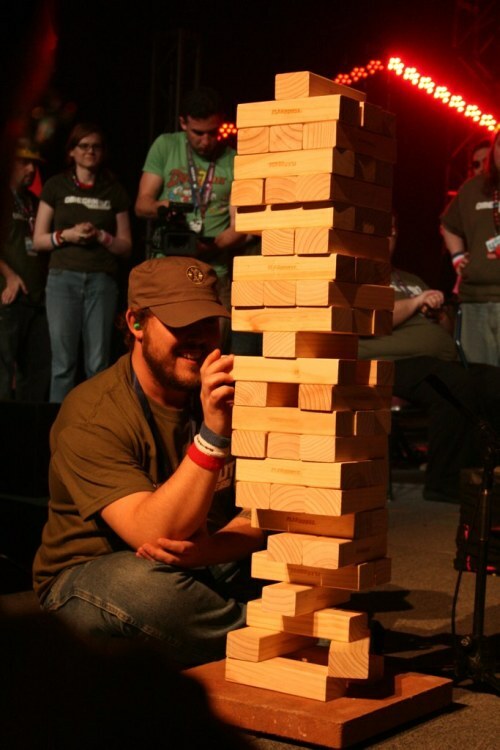 The most amazingly insane game of Jenga I've ever been witness to. Suddenly I find myself wondering what kind of music I have been discarding that I could have been rocking to all this time. Equally as concerning is how those melodies in the old games I do recall could be interpreted and translated to a genre that speaks to me outside of the gameplay. I suddenly saw/see that this is what could be considered part of that ‘culture’ that is being celebrated. And boy was it a celebration. So this brings me back to what I have dubbed “The PAX Effect”. After returning to reality, to home, and to the life that was before my crazy PAX Adventure I find myself wondering if, like that boy in the make a strip panel, there maybe is a community of like minded individuals in my area. A community of people just for me. Will I know it when I see it? Will I magically one day come across some folks who might be interested in all of these things, lack the creepy factor, and are within my age bracket? Perhaps I will make new relationships with folks who are privy to this culture of acceptance that I experienced recently? Time will tell, but in the meantime this subtle change has lead me to consider the approach to my interests, hobbies, and people in general. I like books, sci-fi story lines, artistic concept art, words, challenging puzzles, automotive racing, gory fighter games, and tech/gadgets AND I know I am not alone. Everyone geeks out about something. Maybe it’s cars, maybe it’s gardening, history, or literature. Maybe you love geocaching and travelling or perhaps you are a movie buff or avid nature explorer. Whatever it is that you enjoy doing, do it! As long as it is not harmful to anyone, your passions should be encouraged and embraced. And so it is with a little less hesitation that I carry my Mario purse and consider signing up for the Scrabble night at my local library. That, my friends, is The PAX Effect. As an introductory article at GamerFitNation.com I’ve recently explored the idea of balance and a healthy lifestyle. It’s not always easy, but there are a few tips I’ve learned along the way.